The black head and neck with white "chinstrap" distinguish this goose. This well-known species is native to North America. It breeds in Canada and the northern USA in a variety of habitats. However, the nest is usually located in an elevated area near water, sometimes on a beaver lodge. The eggs are laid in a shallow depression lined with plant material and down. This species is 90-100 cm long with a 160-175 cm wing span. Males weigh 3.5�5 kg, (8� pounds), and can be very aggressive in defending territory. A pair may mate for life (around 20 years). The female looks virtually identical but is slightly lighter at 3�5 kg (7� pounds), and has a different honk. Adult geese are often seen leading their goslings in a line with one parent at the front, and the other at the back of the "parade". While protecting their young, parents often violently chase away nearby creatures, from small blackbirds to other geese, to humans that approach. 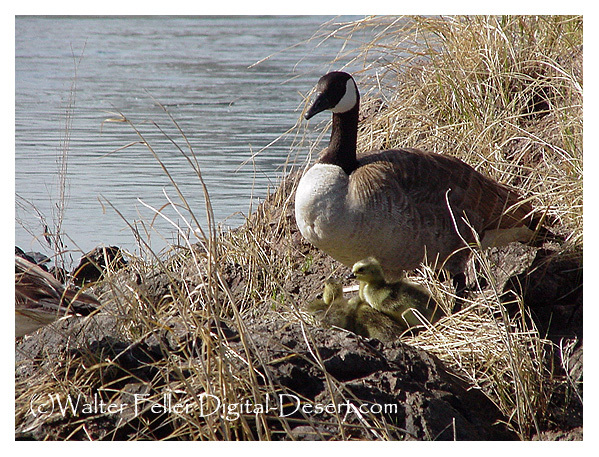 Like most geese, it is naturally migratory, the wintering range being most of the USA. The calls overhead from large groups of Canada Geese flying in V-shaped formation signal the transitions into spring and fall. In some areas, migration routes have changed due to changes in habitat and food sources.